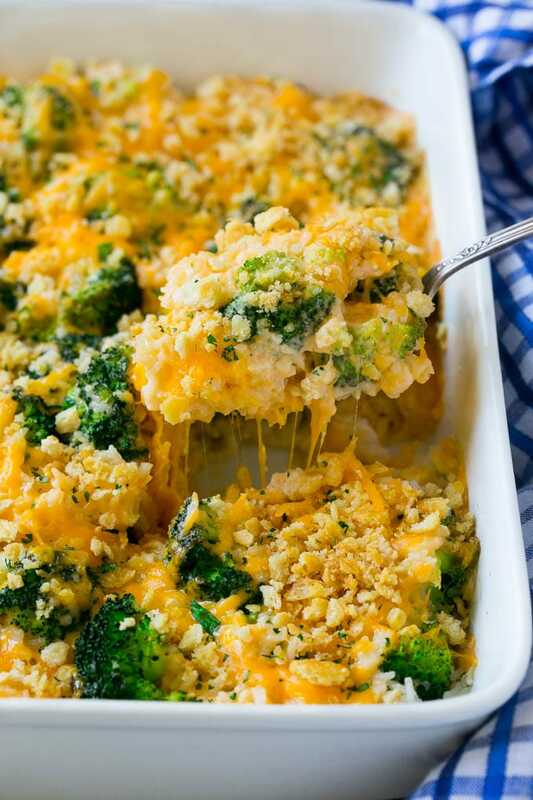 This broccoli and cheese casserole is loaded with broccoli and rice in a creamy cheddar cheese sauce, all finished off with a crunchy topping. The ultimate make-ahead side dish! This casserole is an instant classic which has the right amount of creamy cheese sauce and crunchy topping. For a complete meal you can serve the casserole with roasted turkey breast with garlic and herbs or smoked prime rib. There’s just something about broccoli with cheese, it’s a classic flavor combination that even the most staunch veggie haters can’t resist. This broccoli and cheese casserole may be my favorite casserole of all time, what’s not to love about broccoli and rice in a creamy cheese sauce? 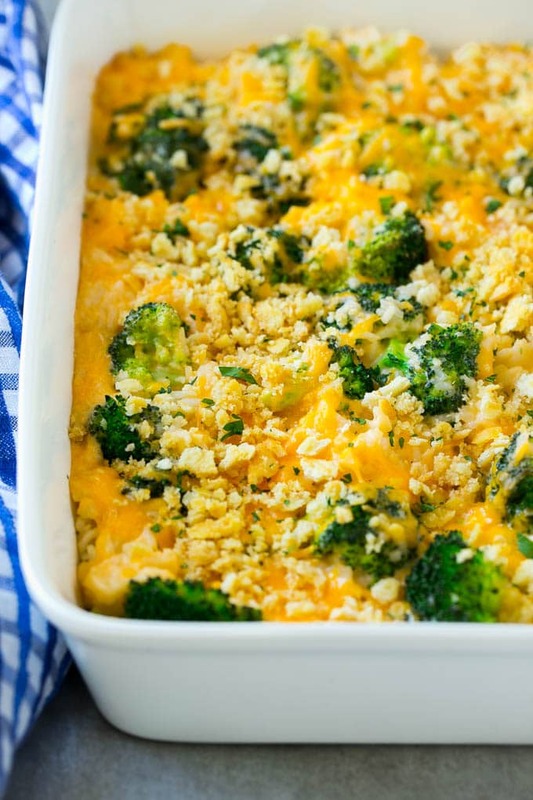 How Do You Make Broccoli And Cheese Casserole? This recipe starts with cooked rice and broccoli florets that have been lightly steamed or blanched. You don’t want to overcook the broccoli because it will continue to cook in the casserole. You can use frozen broccoli here, just be aware that it will be on the mushier side in the casserole. You can use any type of cooked rice you want here, I typically use a long grain white rice, but brown rice would work well, or you could even try quinoa! The broccoli and rice are mixed with a homemade cheese sauce, similar to what you might make for macaroni and cheese. 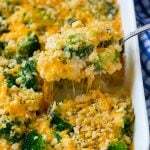 After the broccoli and rice are coated in the sauce, they go into the casserole dish and are topped with more shredded cheese and a sprinkling of crushed buttery crackers. Bake till melty and golden brown and you’ve got an amazing broccoli rice casserole that will get rave reviews! I love that this broccoli and cheese casserole can be assembled in advice, then popped into the oven right before you’re ready to serve it. If you plan to assemble in advance, leave the cracker crumbs off until right before you plan to bake it. I often serve this casserole as a side dish to grilled or baked chicken, but honestly it’s hearty enough that you could even serve it for a main course if you prefer. 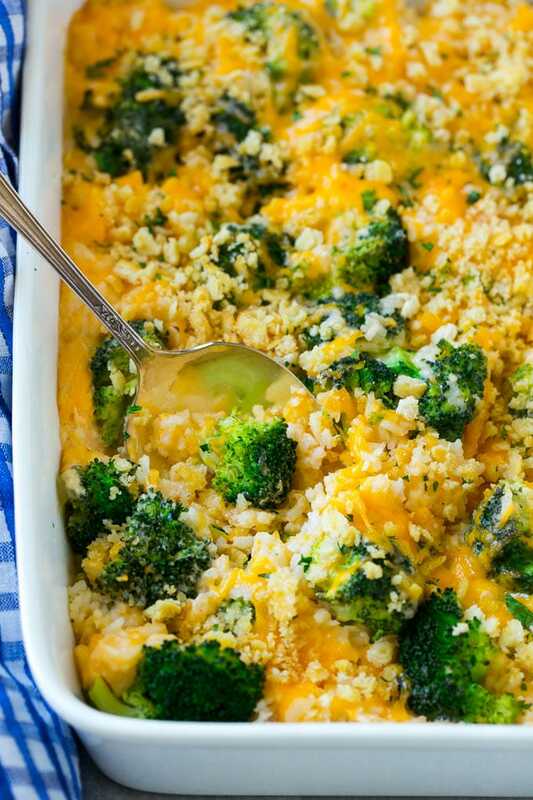 Kids and adults alike will adore this broccoli rice and cheese casserole, sometimes we’ve even been known to eat it twice in one week! It’s just that good. Melt the butter in a medium pot over medium heat. Add the onion and cook for 3-4 minutes until translucent. Add the flour to the pot and stir to coat the onions; cook for 1 minute. Slowly whisk the milk into the pan. Cook, stirring occasionally, for 4-5 minutes or until sauce has thickened (coats the back of a spoon). Add the cream cheese, 2 cups of shredded cheddar cheese and the salt, pepper, smoked paprika and garlic to the sauce. Stir until smooth. Place the broccoli and rice in a large bowl and stir to combine. Pour the sauce over the top and toss to coat evenly. Pour the broccoli mixture into the prepared pan and smooth the top. Sprinkle the remaining cup of cheese over the top, along with the crushed crackers. Bake for 20-30 minutes or until casserole is bubbly and cheese is melted. Sprinkle with parsley and serve. Make Ahead Instructions: Make the casserole through sprinkling the cheese on top. Cover with foil and refrigerate for up to 24 hours. Add the crackers right before you bake the casserole. Add an additional 10 minutes to the bake time. I love broccoli and cheddar! This is a great casserole! Love these make ahead comfort food recipes!